FlexNets #36 Deluxe Nylon Batting Cage Net: 12'H x 12'W x 55'L (With Door, Baffle Net, Sewn Border, Rib Support, Steel Corner Snaps) at Practice Sports, Inc. The FlexNets™ #36 Nylon 12' H x 12' W x 55' L is a Standard Size Batting Cage Net and the minimum recommended for High School use. 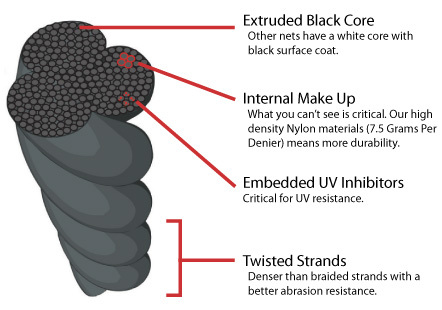 Nylon is a more durable material than Poly, but Poly is naturally waterproof. Nylon has a Resin Bond to provide some water resistance, but requires NetSeal to be truly waterproof. Learn more about the differences between Nylon and Poly in our Getting Started Guide. *Lifespan are estimates based on optimal conditions. Lifespan is influenced by many factors including, but not limited to, frequency of use, age of players, and suspension method. 10% Resin Bond on Nylon nets secures knots and makes Nylon net more weather resistant. Nylon Melting Point = 510 degrees means faster approvals from Fire Marshals. Black UV Inhibitors infused to the core for ultimate UV protection. Stretched to Size - Hydraulically stretched at factory to improve knot tightness and reduce stretching and shrinking over time. What is NetSeal? What is NetShield? NetSeal for Standard Nylon is a Latex Water-Based Dip the netting soaks in to become waterproof. Reinforces your tunnel in the high impact areas. Let us help you find the right net for you. Enter your dimensions for an instant quote. 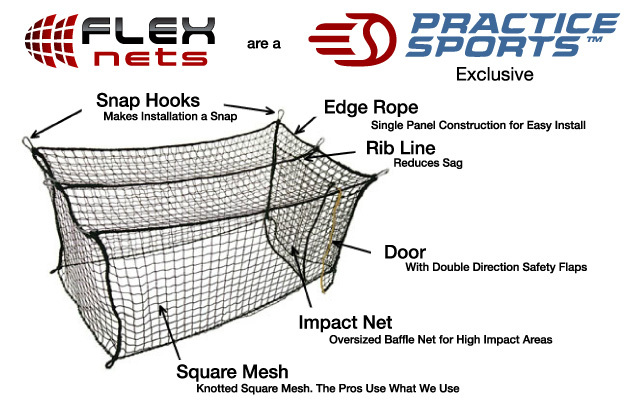 Complete kits for all of our Standard Size Nets. Safety screens protect your players. Improve the look & safety of your cage. These Cages are just what we needed in our facility. we have a great little set up now. Very happy with the quality of the nets. Thanks a bunch for your personal assistance; that separated you from the other web sites.